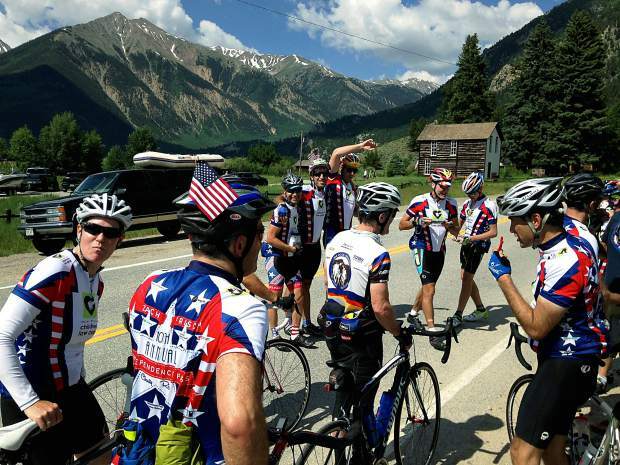 Cyclists reconvene in Twin Lakes for the 10th annual Independence Pass on Independence Weekend Charity Ride, sponsored by Trailbreak Partners. The event raised money this year for the Rcoky Mountain Children's Law Center. The cyclists pedaled to climb Independence Pass and to raise money for charity last weekend. Aspen native Zach Frisch, now living in Denver, organized the 10th annual benefit ride with his Trailbreak Partners organization. The group of 40-plus donors rode from Copper Mountain to Aspen via Independence Pass on the annual charity ride. Frisch said the group raised more than $7,000 for the children’s law center with this year’s ride. “God bless America,” Frisch said. For more information on the charity organization, visit childlawcenter.org. “They are only able to serve as the voice for the kids who need help most because of the generosity of donors,” Frisch said.